Rosie Rat or Rosie the Rat, Free Shipping, There isn’t a better cat toy. The Original Rosie Rat was created in 1964 and has been made over 8.5 Million times that is according to the creator of this wonderful product. Truly time tested. We are excited to include the Original Rosie Rat hand made in the USA product. Cats love the Original Rosie Rat and we do to because it is handmade with quality material and it lasts and lasts. Don’t be put off by the Original Rosie Rat meek unassuming appearance. Flat as she is, she will delight your cats to no end. Constructed of all natural materials, she is a perfectly safe cat toy. Her fuzzy body is made of rabbit fur scraps purchased from the food industry. Her head and tail are made of soft suede leather, eyes, nose and mush stash are hand sown leather as well. The body is rabbit fur for good luck. If your toy doesn’t have hand sown eyes and mush stash its not an original and maybe a knock off so watch out what you are buying else where!!! The Original Rosie Rat measures approximately 3 inches from tip of nose to end of body, and 5 inches overall, including tail. Colors vary from white to tan to black. Handmade in the USA. The Original Rosie Rat was named one of the Top Ten Cat Toys for the 1999 Holiday Season by Cat Fancy Magazine. 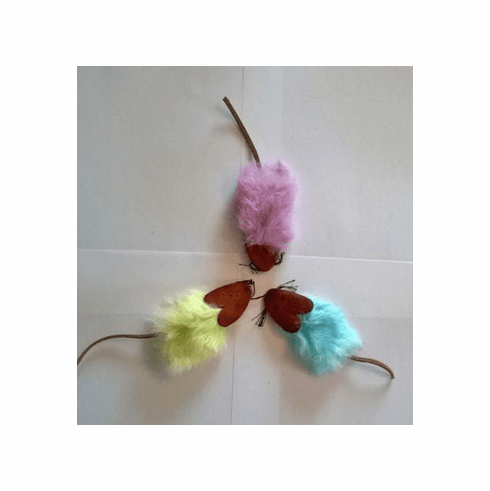 Please note: Because the Original Rosie Rat cat toys are handmade and no two will be exactly alike. They may vary slightly in size and shape but cats don’t mind--they go crazy over them no matter what! The Original Rosie Rat is by far my cats favorite toy! said Jane (FL) They reduce it to only a little leather head. I find the remains under chairs, sofas and shoes weeks later. They sometimes just carry the heads around and drop them in the water dish. Lots of frisking for your money!